Now that we are back in the land of Tex-Mex, and really cheap Tex-Mex ingredients, I can’t get enough…we can’t get enough. I feel like I’m making Tex-Mex once or twice a week…because ingredients are so cheap, and everyone loves to chow down. Enchiladas, layered enchiladas, fajitas, quesadillas…and now chicken fajitas meet quesadillas. Whatever it may be, we love Tex-Mex. Make your fajitas on the grill or in a skillet. Mix ’em up with cheese and slap between some tortillas. Bake, grill or saute them…bam! Your frugal dinner is ready! 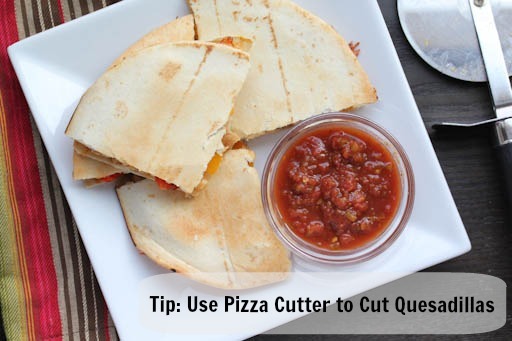 Also, don’t forget to cut your quesadillas with your pizza cutter! Buen provecho! That means Bon Appetit, or enjoy your meal…in Spanish! Cook the chicken breasts with the seasoning, with the sliced onions and peppers. Cook until chicken is cooked through and peppers and onions are softened. Lay out 6 tortillas on baking sheets, add a pinchful of cheese to each tortillas. Spoon the chicken fajita ingredients evenly over each of the tortillas. Add another pinchful of cheese over the chicken fajita mixture. Top with the other 6 tortillas. Bake or grill the quesadillas. Bake at 350 for 10 minutes, flip and bake another 10 minutes. If grilling, grill over indirect heat for 8 to 10 minutes per side, or until tortilla begins to brown. Flip and grill the other side for a few more minutes. Cut with pizza cutter into 4 or 6 slices each. Prepare rice and beans or other side dish and garnish. 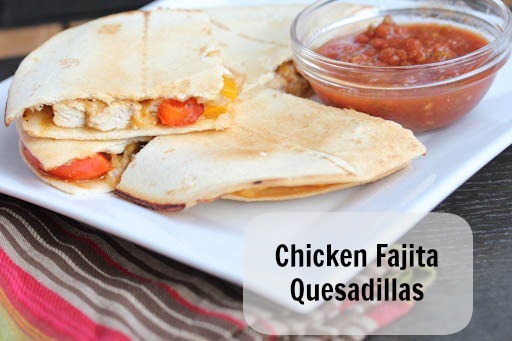 Serve Chicken Fajita Quesadillas with Rice and Beans. how much does one month of recipies for a family of 3 cost? Does that price include 3 nacks a day also? how do you spend less with coupons from the paper? Have you considered having an online course for couponing 101?